I think that these ideas will facilitate building the system. This has been the goal from the Start. I think that the information I have supplied should allow anyone with a lathe, and welding gear and a home foundery able to melt brass, alum, and copper, to simply build one. The design uses as many parts that are readly available. 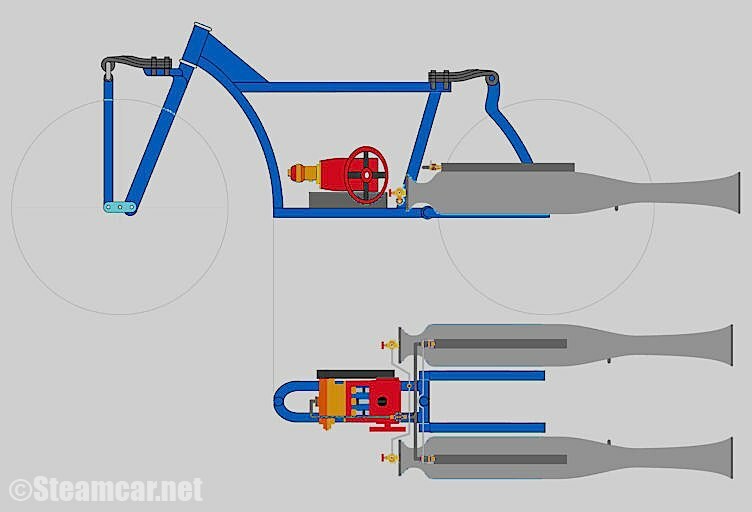 If you wish it could be the "STEAM BIKE KIT" that was previosly discussed for limited production, I think a Bike could be composed and ready to final assembly, for under the cost of a new motor scooter. At least here in the U.S.A. it would be class as a Moped inspite of it's Vast torque and probable preformance. I am unsure of the water use per mile, but it will run for 20 hours full blast on the burners on one gallon of petrol, or white gasoline using the Colman components. "I have tested them." So it is a given amount, one full liter of fuel at full burn will last for 14 hours on both burners of the stove, As the jetting is same, the fuel use will be as well. So one US Gallon is about three liters, or 20 hours of burn at full blast on both boilers. Facebook:- Click here to see my facebook page. General layout can be seen in this picture. A Coleman Twin burner duel fuel camp stove fuel unit that has been shortened and fitted to a new heating loop. The center nozzle of the burner has a needle the by pass block for the heating loop must be drilled and ported to fit the shortened needle of the burner high/low knob which is later fitted to the bimetallic spring type thermostatic unit that turns it down if it get's too hot. Shown here is the boiler and burner layout. 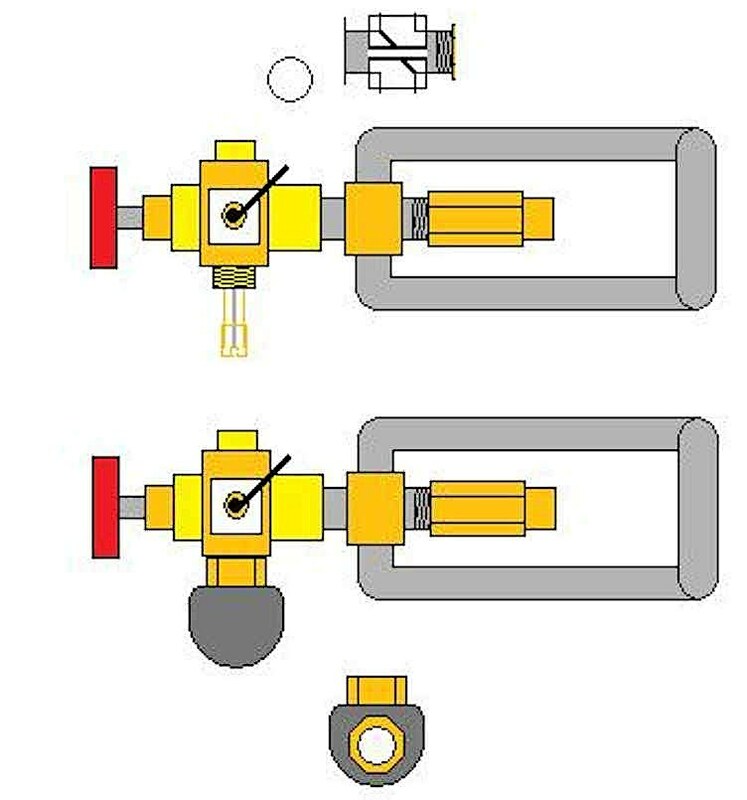 The boiler runs a quick heat up, and self induction by the same nature of principal as Valve less pulse jets, but used for heat, not for the sake of thrust. &nbspThe biggest Difference betwixt this flash boiler and the type you have seen before is that it is heated to just below red hot, before the feed water turns on, then it mists water in to each tube, individually, it builds very high pressure in almost no time at all, and must have a large volume blow off valve, just as in a modern turbo cars spool system, but for the purpose of venting steam to the condenser. Thus the very thick wall steel tubes that are shaped while red hot to the spirals. Water is misted in to each tube from the inner most point, and flashes to steam spiralling out to the joining block, then on to the boiler's steam pressure regulator, this small volume chamber joins the boilers and allows a space for the steam to cool and gain volume, this is plumbed in before the engine and prior to the pressure reducer, or pressure control valve assembly, just as you would a welding gas pressure regulator. This chamber is to reduce the steam pressure to 350 psi. range, but also allows for the pressure to be turned up via the knob on the pressure regulator. The joining chamber may also hold a feed water loop for pre-heating, but I doubt it will be needed. 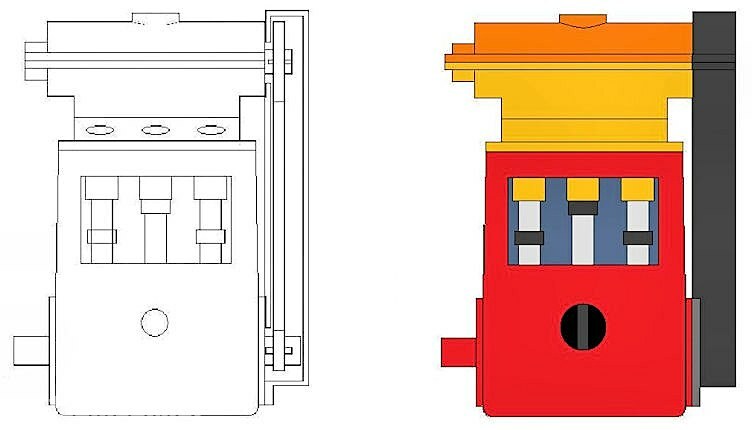 The burner will remain on and turn down flame only if it is showing to hot a boiler coil temp via the thermostatic probe, one from a propane oven would work well, as they have the ability to be easily and accurately set for a wide range of tempratures. The Feed water also will shut down in the event that the temperature of the inside steam/air temperature drops below the range of thermostat, and only comes back on when the tubes have cleared and heated to useable range once again. Shown here is the engine layout, I have secured a second crank and block assembly and am planning if all go's well to offer the new over head globe valve type cam in head top side. More information will follow shortly. Camshaft turns 180 deg. every 360 degree rotation of crankshaft. Cam Ports are drilled every 120 Deg. from each other. Pump schematic. BEFORE engine mod. Stock Pump side profile, BEFORE engine mod. 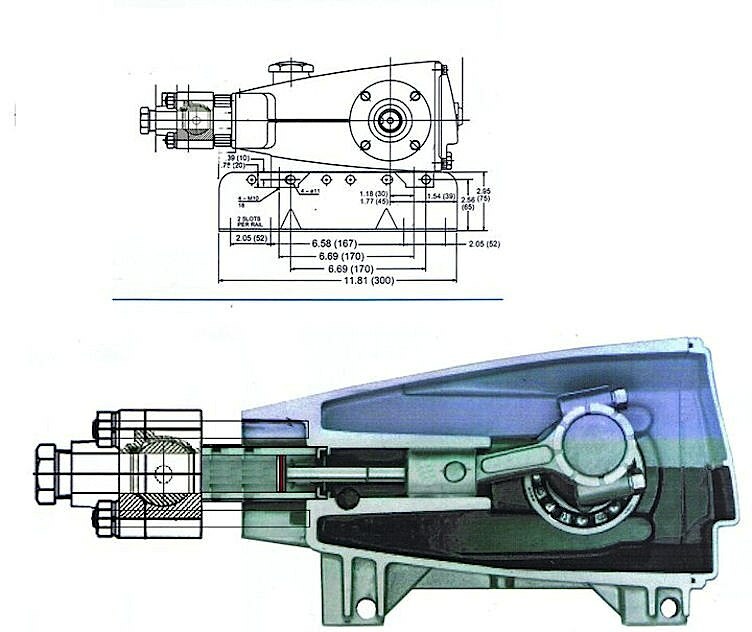 Schematic and profile after modification to a steam engine. 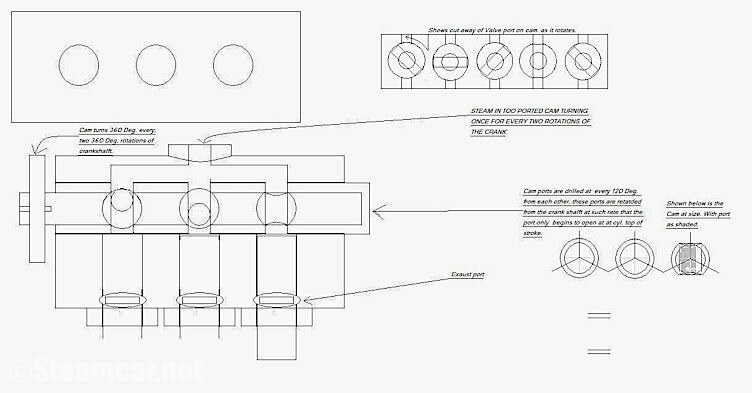 Click here to go to Richard Foisel's boiler design.